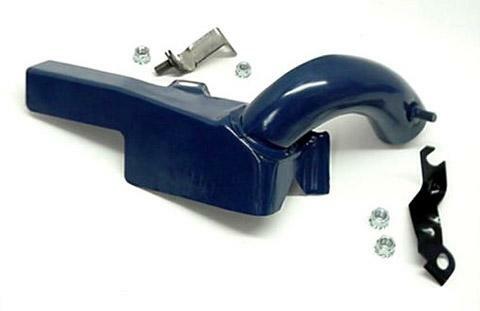 The exhaust manifold heat shield is connected to the air cleaner snorkel via an s-tube, allowing air heated by the exhaust manifold to flow into the air cleaner. Ford identified these heat shields using basic part number 9A603. The 428 CJ heat shield is identified by part number C8OZ-9A603-B. These stamped-steel shields are painted Ford Corporate Blue and consist of a heat shield with a curved tube welded on at the front end. Two brackets are used to attach the shield to studded exhaust manifold bolts. The rear bracket (shown below left, circled in red) is usually natural stamped steel. The front bracket (shown below right, mostly hidden behind the tube) is angled at the front to fit a mounting stud found on the front of the tube and is usually black. 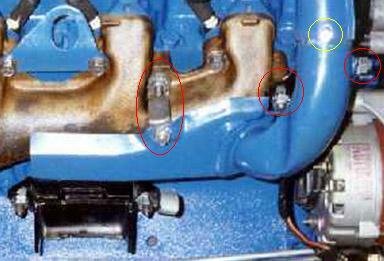 A small sheet metal screw is used to attach the heat shield to the s-tube; the screw mounts into the shield tube through the bottom of the s-tube in a small slot that's circled below in yellow. See the "dent" near where the tube attaches to the heat shield? That's normal and not indicative of damage. I've never seen any sort of engineering number formed or stamped onto this heat shield. NOS versions usually have a sticker containing the part number attached along the outside. I've seen a reference that claims the engineering number (probably ink stamped) could be C8OF-9A607-D, -E, or -F, but with the heat these parts are subjected to paint and ink stamps don't last long. Thanks to Joe Sikora and Bill Upham for the pictures used here.